What Lives in the Ocean’s Twilight Zone? Ann Bucklin (Professor of Marine Sciences) participated in a research cruise aboard the R/V Henry B. Bigelow exploring the deep layers of the North Atlantic Slope Water with oceanographers and engineers from the Woods Hole Oceanographic Institution and National Marine Fisheries Service. 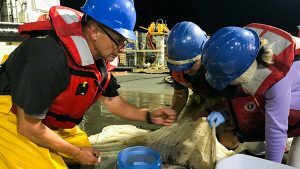 The expedition during August 10-21, 2018 was the inaugural cruise of the Ocean Twilight Zone initiative (OTZ, see https://twilightzone.whoi.edu/), a 6-year, $35 million effort that is using innovative technologies to document the ocean’s mysterious midwater layer. A combination of sonars, cameras, and sampling systems was used to try to quantify how many and what kind of animals live in this dimly-lit swath of ocean hundreds of meters below the surface. They found an abundance of marine life including zooplankton, squids, salps, and fish. The findings suggest that the sea’s murky depths might host more life than we thought. See https://twilightzone.whoi.edu/news/.